I was going to do a root vegetable soup recipe this week but when I saw our red cabbage coming in from the Healy’s farm in Wicklow I decided to change tack. They’re enormous!! Don’t worry though, they keep very well in the fridge even after you’ve cut into them. 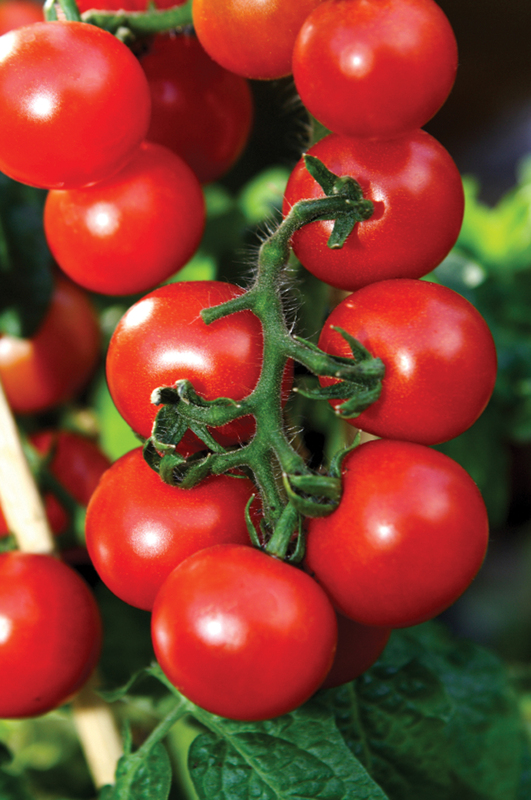 Like all cabbage, the red kind is packed with iron, calcium, potassium and fibre and is also high in vitamins C, B1, B2. B3 and D. I’ve always tended to use it in salads where it works really well with things like carrots, apple, pears, all kinds of nuts, avocado, goat’s cheese, feta , onion, Asian flavours like soy and mirin ….. Recently though, I’ve start cooking with it and find it works really well in soups and stirfries. As the weather’s turned so nippy my first recipe this week is for a kind of lentil soup/stew that is perfect for this kind of weather. It’s really simple to make and it’s a great way to get kids (big and small!) to eat loads of vegetables. As lentils are so nutritious (they also lower cholesterol I found out recently) this dish is a meal in itself, especially if you eat it with some brown rice. This recipe will give you enough for about 4 or 5 servings. Leftovers will freeze well or make a very quick lunch the next day. I should say that the list of ingredients is not at all prescriptive but a guide – feel free to add any root veg you have lying around as well as celery, peppers and tomatoes. If you have spuds don’t add them until after the first half hour of cooking as they will fall apart and go to mush. Courgettes don’t really work as they just disintegrate and aubergines need too much precooking which just slows things down too much. As time is almost always of the essence for me, rather than preparing all the veg before I start, I chop and add the ingredients to the pot as I go. So, begin by chopping your onions then saute over a low to medium heat in a generous amount of olive oil (ie enough to stop you having to stir things constantly). As the onions get going, dice your carrots and throw them in followed by the mushrooms (roughly chopped). Add some salt, the thyme and bay leaves and turn up the heat slightly to allow the veg to fry rather than sweat for a few minutes. Roughly chop your garlic and throw it in turning down the heat slightly. Shred the cabbage and add that too. Cook for a few more minutes then add the tomatoes. Rinse the lentils and throw them in along with the stock. Allow things to come to the boil then turn down the heat and cover. Cook for about 50 minutes stirring occasionally. To serve drizzle a little Sherry vinegar or sprinkle with grated Parmesan. 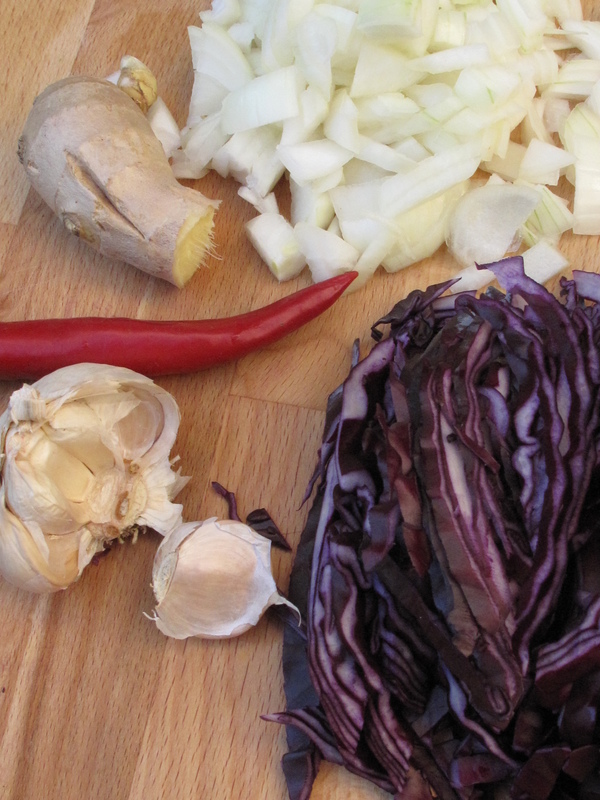 Another recent discovery for red cabbage has been stirfried with rice which goes well with fish, tofu or dahl. 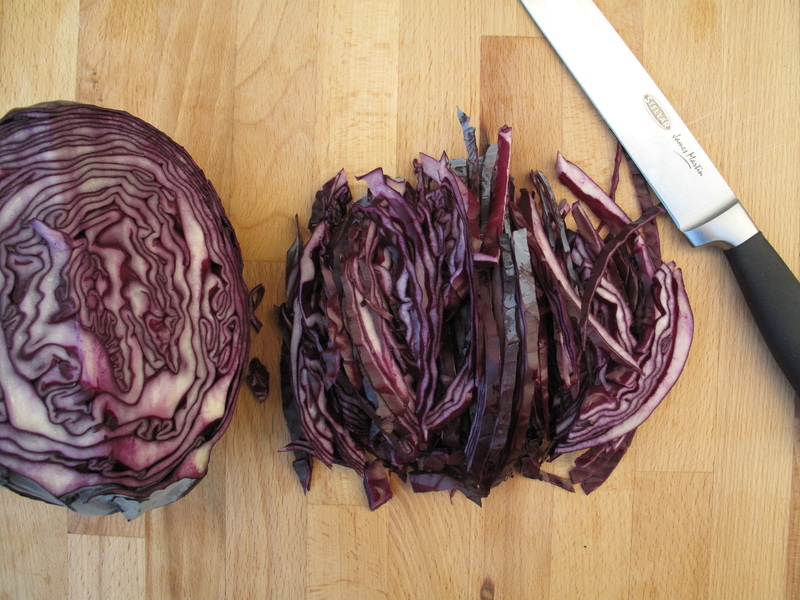 Either way, the red cabbage makes any dish look gorgeous. I tend to cook some brown rice at the beginning of the week so I’ve always got something to take the panic out of cooking midweek. I prefer the shortgrain brown type which apart from being really, really good for you, has a delicious nutty flavour. You’ll find it in your local healthfood shop (The Hopsack in Rathmines is my fav). Begin by chopping the onions and shredding your cabbage. Heat some vegetable oil on the pan and throw on the onions and toss them over a medium to high heat for a few minutes. Add the Cabbage and continue to toss everything. Turn down the heat a bit and add the garlic and ginger along with a little chilli of you fancy some heat. 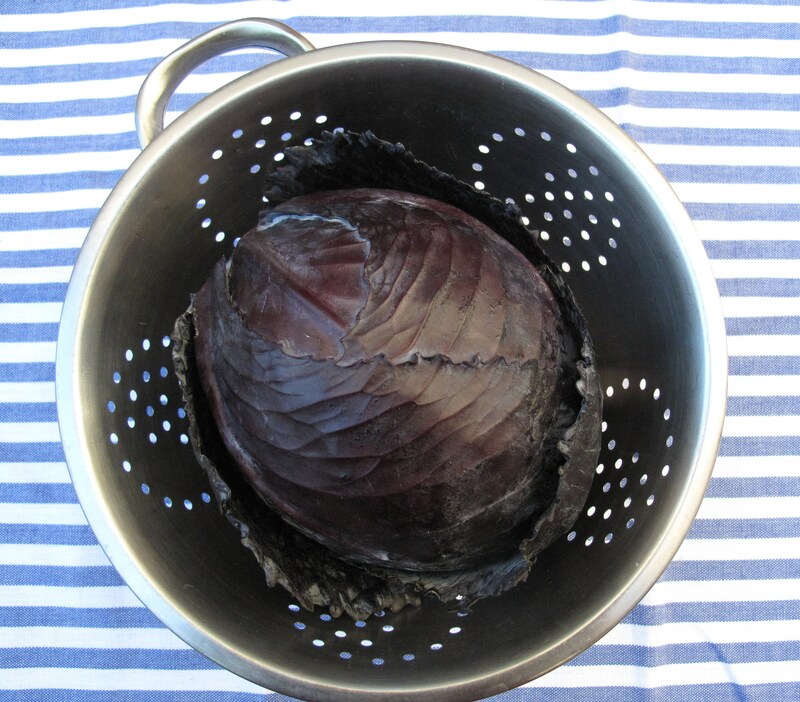 Continue cooking until the cabbage has wilted and the garlic has softened. Add the rice and continue cooking until it has warmed through then turn off the heat. Toast the pumpkin seeds on a dry pan over a medium heat until they have started to pop and change colour. Mix them through the rice along with a dash of soy sauce or tamari and serve. A quick supper of stirfried brown rice with Chorizo and Broccoli with a Red Pepper and Goats Cheese Omelette – ready in under 15 minutes!!! How to make dinner fast is the big challenge for most of us during the week. With the best will in the world I never seem to have the time to cook ahead and often find myself opening the fridge and scratching my head when everyone’s already starving (especially me!!). August sometimes climbs into his high chair and waves spoons at me while I go from fridge to cupboard trying to come up with the answer – I think he finds it all quite amusing… Dan has taken to the old “what’s for dinner?” and “when’s it ready?” x 100 followed by vomiting noises when I pull anything green out of the fridge (then of course he wolfs it all when the time comes) . In short it can be a bit high pressured round at ours at dinnertime. As I’ve mentioned previously, having a stash of precooked rice in the fridge regularly saves the day and I can’t recommend it highly enough. Last night we had that crazy, everyone starving /no one thinking straight thing going on so I just pulled out some random bits from the back of the fridge hoping that seeing on the kitchen table would provide inspiration. Out came broccoli, eggs, goat’s cheese, a pepper, some leftover rice from a stir fry Paul had made the day before, a piece of chorizo and a bag of greens. Mmm.. When you’ve got eggs and everyone’s starving it’s really got to be an omelette so I started by slicing the pepper into strips for a filling. I threw them on a hottish pan with some olive oil then started thinking about the rice – fried with an onion and some chorizo (a little bit of this stuff gives a lot of flavour so it’s a great standby). I decided to steam the broccoli and toss it with the rice to give it the benefit of the chorizo hit too. The goat’s cheese went into the omelette with the pepper and to round it all off I made a salad with the greens, throwing in slices of a perfectly ripe avocado from the fruit bowl. I dressed this with balsamic vinegar and a tiny bit of salt. Start to finish took 15 minutes. Sounds good? Well, just follow these steps………. Right, get the pepper in the pan as I described above first then chop the onion and put it on another pan with some olive oil. As the pepper and onion start cooking break the broccoli into bite sized florets and put it on to steam. While the broccoli is doing, chop up the chorizo into smallish chunks and add it to the onions and cook for a further 5 -6 minutes. When it’s ready (this should take 2-3 mins), take off the broccoli and set aside for a moment. Wash the rocket and set that aside. Add the rice to the onions and chorizo. Mix well and continue to toss every minute or so adding in the broccoli after 3 minutes. To fully heat the rice will take about 5 minutes of tossing which gives you enough time to make the omelette. Remove the peppers which by now will be nice and tender. Beat the eggs with a generous pinch of salt and some freshly ground black pepper. Heat a little oil in the pan (I’d use the same one I fried the peppers in). Add the eggs and move them around until they start to set then add the goat’s cheese and pepper. When the cheese has softened, fold the omelette and turn off the heat. 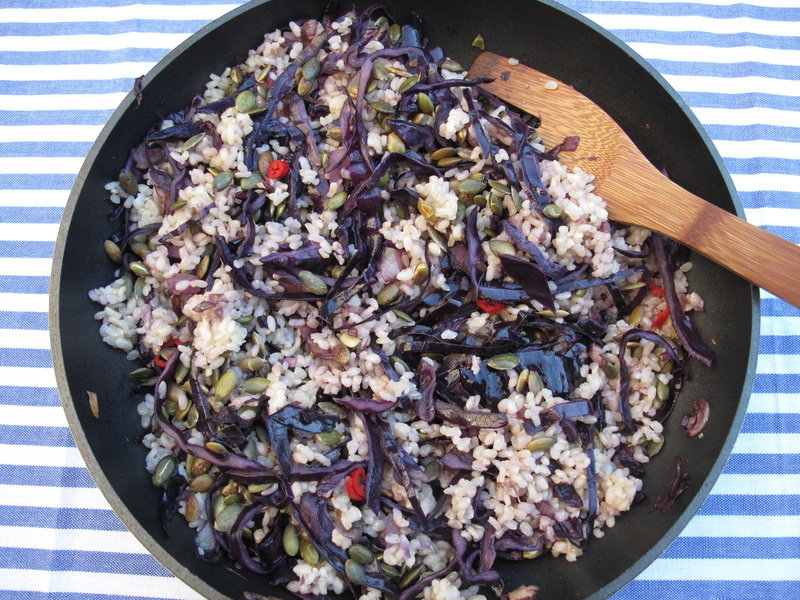 Toast a handful of pumpkin seeds on a dry pan then mix them through the rice. Chop or slice the avocado into the rocket, dress with balsamic vinegar and a little salt. That’s it, dinner’s made!!!! So you may have noticed that this week’s garlic is a bit different. Well, it’s the fresh or wet kind and it’s pretty much the same as the regular stuff except it’s that bit sweeter and quite a bit milder. Follow this link http://wp.me/p7YZu-7x for a lovely aioli recipe that you can eat with roast veg and spuds aswell as one of fresh garlic bhajis with green chilli and coriander, while this one http://wp.me/p7YZu-8m will bring you to a really nice (and very fast) pasta recipe. Yay for links – I’m new to them so am very pleased with myself at the moment. Stop smirking!! Anyways, I’ll have some fresh ideas on this kind of garlic in weeks to come but these will get you started. Need a recipe fast? Search by ingredient. What to do when bananas go bad………..
All recipes, photos and content on this blog are copywrite of Sarah Merrigan. I am usually more than happy to share but please get in touch before you do!